Feel floral with our 20 cute nail art designs that are inspired by flowers! Who doesn’t like flowers? And I am pretty certain that atleast one outfit in your wardrobe is floral. That’s why this post is dedicated to all you lovely ladies out there who adore anything floral. This time, Zuri brings to you 20 stunning (and actually cute too) nail art designs that are inspired by roses, daisies, sunflowers and so many other varieties of flora! So, this fall season, wear your nails in style. Paint them bright in yellows and reds or stick to the pastel shades. Draw your favorite flower and team it up with the fall/winter outfit of your choice. Either have flowers scattered across the nail or let them touch from tip to tip or wear just one petal on each nail, but be sure that the nail art design looks as pretty as the real flower(s). My personal favorite are tulips, jasmines, shoe flowers and red sea poppies. I stick to one theme at a time, for instance if it’s sea poppies, then I have a pair of them on each nail. A bit of green too for the effect. One particular floral nail art design that has got really popular is cherry blossom. The nail colors typically used for this one design are light, subtle. Pink set against mint green only does justice to this exotic theme. The good news is that you can also do a bit of a mix ‘n’ match. I mean, add another nail art design with your floral design-theme, for instance a dash of polka dots or straight lines to your otherwise floral-ish pattern. Using the blended color technique is another way of beautifying your nails. It also gives an impression of 3-D. And, how about yellow sunflowers set against a golden base coat? Or purple orchids on white? 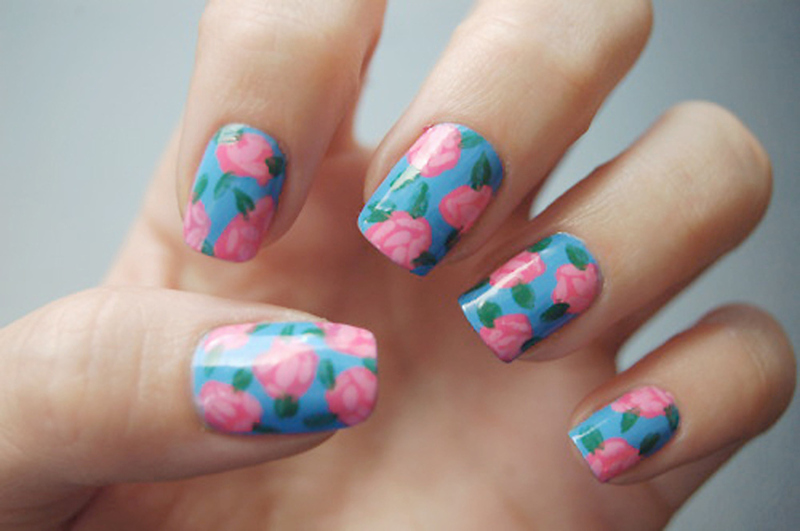 You can also accentuate the white base coat with big floral prints in multiple hues. Use decals, glitter, studs and crystals on the stems and leaves to connect one flower to the other. 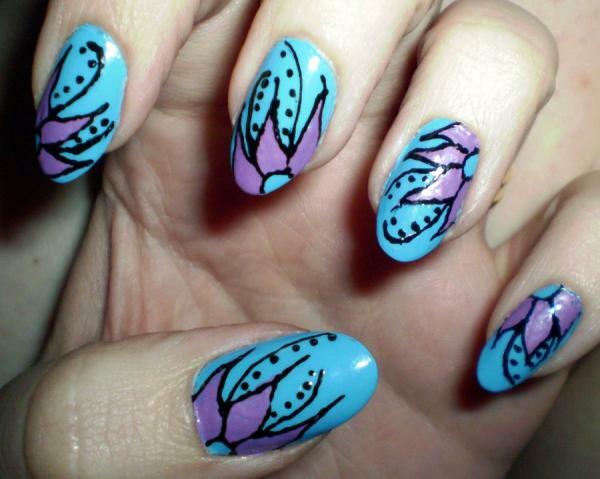 There is another creative DIY nail art design that is a rage among girls these days. Select 2 of your favorite colors. Have 4 nails of one hand done in one of those colors, and decorate the one remaining nail with flowers in the second color (while the base coat remains the same as used on those 4 nails). You can also try French tips, the only twist here is that your tips aren’t white anymore, instead, try a line of navy daisies. If you are feeling quirky, wear a funky design, such as a zigzag pattern or a graphic and alternate it with lilies to break the monotony. So get inspired by your garden, grandmother’s table cloth, vintage designs, or perhaps your mother’s tea set. Paint your nails in lovely, fresh and beautiful flowers. Add an extra touch of femininity to your hands. Brighten up the Fall/Winter season with a bouquet of roses that lasts longer than it should.